As I mentioned Friday, my son and I were out at Indianapolis Motor Speedway on Saturday to watch the Chris Griffis Memorial Mazda Road to Indy Test. We saw just a bit of Star Mazda, but managed to see a good bit of Indy Lights. It's just a single test, and obviously it's tough to tell much, but Peter Dempsey just always looks sharp out there (I later found out that he and Tristan Vautier topped the session times, which doesn't surprise me). I certainly hope he finds a solid ride in Firestone Indy Lights for 2012. I think if he had a solid deal, he'd be a championship contender. In any case, my son loved every minute of the cars on track. We had the Team Moore #2 car (with Carlos Muñoz) go slightly off course right by us where the road course joins the oval by Turn 2, and he was super-impressed with it all. I doubt it was his intent, but Carlos Muñoz, you inadvertently really impressed a 2 1/2 year old kid. It was pretty sparse in the early morning, but folks started showing up on the viewing mounds more towards the later morning with the Indy Lights cars on track. For those keeping track at home, my son's two favorite cars seemed to be the Pelfrey Racing #81 (Petri Suvanto) in Star Mazda, and the very red #4 of Belardi Racing. As all preschoolers know, it is an indisputable, scientific fact that red cars go faster. (This may also explain why in the museum he want to sit in the day-glo red 1968 Lotus turbine of Graham Hill, but that's probably just an early sign of extreme good taste). From what I heard of the weekend, the paddle shifter test (carried out on Team E's #17 car), was a big success. There was a lot of positive feedback, which is a good thing. Indy Lights is one of the few larger open wheel series not employing paddle shifters. It's not a huge cost, and can allow drivers to keep their hands on the wheel. All in all, I hope everyone involved felt the Memorial Test was a success, not only because it's a fun event to have at the end of the season, but because it's honoring someone who worked extremely hard to make his team a success on the Road to Indy. If they do it again next year, I'll be there. Spending a late October morning with your son at the Speedway watching him point out every time a car goes past beats just about anything else going. Shelby Blackstock: Reba McEntire's son will be testing at IMS for Andretti Autosport in a USF2000 car. Blackstock's been busy in Skip Barber, but already seems to have plans to run a full Continental Tire Sports Car Challenge schedule for Roush in 2012. It'll be interesting to see if this leads anywhere. Peter Dempsey: Dempsey never seemed to get a square deal in 2011, what with O2RT being suspended mid-season and missing a week before signing with Andretti Autosport. It'd be nice to see the driver get a full Lights drive for next year; few deny he's got the talent to do something if he can get a few breaks. Armaan Ebrahim: The F2 Indian driver will be testing with Jensen Racing for Indy Lights, and to put it lightly, opinions are mixed on his talent level. He didn't have many superb finishes in F2, but was proficient in overtaking. He might be one of the biggest cipher on this level if he goes to Lights next year. Thomas McGregor: The young Canadian was just announced as an Andretti USF2000 driver for 2012, and this will be our first chance to see him in a car for the team. He'll be one of the few drivers already certain of his '12 plans when he takes to the track today and tomorrow. Shannon McIntosh: After a rookie USF2000 season with Cape/Wayne Taylor, Shannon will be testing alongside J.R. Smart for Pabst Racing. She remains a fan favorite for ladder series fans, so folks will be watching to see just where 2012 takes her. Petri Suvanto: The "Flying Finn" will presumably be moving up to Star Mazda after winning USF2000's championship. He'll be testing with Team Pelfrey, alongside British Formula Renault 2.0 driver Jack Hawksworth. Tristan Vautier: The Star Mazda champ takes a Lights test with Team E; this will be his first time in the type of car we'll get to see him in for 2012. Vautier was very sharp in Star Mazda; it'll fun to see how he makes the transition to the next level. Zach Veach: Veach is pretty sharp at the entire publicity business (seriously), and as such he's become one of the more recognizable names in the ladder series. He got to finish the season in Star Mazda last year, managing a podium result, and you have to think his destination with Andretti is the same this year. Webb straps back in this weekend. Oliver Webb: Webb will be in a Sam Schmidt car for the test, and frankly, it's just going to be good to see a Schmidt car back on track after some had questioned if the team would return to INDYCAR for 2012 after the tragedy at Las Vegas. One test does not a commitment make, but it's still a good sign, and there's an article (still-unconfirmed) suggesting Webb will go to SSM in '12. It's going to be cold in Indy, with a high of 53/54 both days. It'll be worth following to see how the drivers do on the IMS road course, which is what they'll be utilizing for the test. With 43 cars currently on the entry list, there's a pretty good chance we'll see some last-minute tweaks, additions, cancellations, or other changes along the way. I plan on taking at least one of the kids to the track Saturday morning. It's going to be chilly, but kids love race cars, whether it's a full-blown IndyCar, or something like the Star Mazda or Lights machines we'll see during this test. It'll be a good opportunity to see some different drivers, check out the ladder talent, and spend some quality time at IMS. Of course, the odds are tough for many of the drivers to one day run the Indy 500 or have a permanent spot in the IZOD IndyCar Series. But I rather like the idea that for at least a couple of them, I'll be able to say, "I saw them test at Indy back before they made it to the top". Let me tell you a story involving Bertrand Baguette. This past May, I watched as Danica Patrick took the lead late in the Indy 500. A few laps later, Bertrand Baguette passed her for the lead. Possibly a dozen people out of 250,000+ souls in attendance cheered that move. I believe our small contingent in J Stand comprised at least half of that number. Reporters not involved normally with INDYCAR outside of the 500 scrambled to find something, anything on this young man with the wonderfully improbable name. So yes, to say I am a Bertrand Baguette fan would be a factual statement. Even though he came a few laps short from winning the 500, his P7 finish accented what we already knew about him: this guy can drive. Getting to meet him this May, he was also a really quiet, pleasant, down-to-earth guy. Unfortunately, like many very capable drivers, the funds for a full-time ride for the mighty Breadman were not forthcoming in 2011. So when the rumors began surfacing yesterday that he was one of the top names in the conversation for the vacated seat for A.J. Foyt’s team, was I pretty psyched up over it? Yes indeed. The Bertrand Baguette Fan Club (American Chapter), or BBFC(AC), is overwhelmingly in support of this rumor becoming a reality. Does this kick off silly season? I guess it does. Yes, I am going to pull for Baguette to land that ride. For a driver who might lack the big budget of another driver, Foyt’s sponsor deal with ABC Supply has to make it look pretty attractive. Of course, because it is silly season, we will likely hear Buddy Rice, Francesco Dracone, Willy T. Ribbs, and possibly the Loch Ness Monster (complete with grainy photographic evidence of the alleged contract signing) as in contention for the seat. So, no, I don’t know if AJ Foyt will sign Bertrand Baguette, any more than Foyt knows whether his next brush with mayhem will be killer bees, an escaped mountain lion, or possibly a small asteroid . Maybe he’ll invite him on a bulldozer ride, or demand he make him waffles first. All I know is, it’s silly season, Bertrand Baguette is in the mix, and I can’t wait for the weeks and months of wild speculation to begin. And what a time silly season is! Dreamers get to dream, pundits get to expound on moves both imagined and real, and all fans get to have that little extra bit of hope that their team or driver will make that ideal scenario happen. Justin Wilson, Tomas Scheckter, and Martin Plowman, your ears should be burning pretty soon, if they aren't already. Ladies and Gentlemen, start your scenarios, scuttlebutt, and conjecture! I wanted to share my story with you about my experience with Andretti Autosport this year. I live in Waterloo, Indiana, population 2,200. I was approached by the Town Manager to see if I would be interested to lead the town in participating in the "Back Home Again In Indiana" contest. It was late March and I said I would but I would need help. I led our participation with the help of the Town Manager and the President of the Redevelopment Commission. Our theme was "The Indy 500 brings families together." I wanted to get all aspects of the community together, so I started with Waterloo Elementary School. I found 6 different IndyCars on the internet and gave each grade a different car to color. All 269 students participated by coloring the pictures. I then partnered each grade with 6 downtown businesses where each picture was displayed in the businesses storefront window for the whole community to see. I then had the DeKalb Middle School and DeKalb High School art students do various art projects of what the Indy 500 meant to them. We displayed these art projects in the restored Waterloo Train Depot from the early 1900's. For participating in the contest, each town received x amount of tickets for qualifying based on your towns size. Our town received 200 qualification tickets. We decided to stick with our theme and disperse the tickets with that in mind. There would be a winning student from each grade (K-5). The student would win a ticket plus 2 tickets for both parents. We awarded winning students from the middle and high school with a ticket plus 2 so that their parents could go with them. We also did a random drawing of teachers and gave them 3 tickets so they could take their husband and kids as well. I sent Randy Bernard, the CEO of the Izod IndyCar Series, an e-mail to see if I could get a driver up to Waterloo to pass out tickets to the winning elementary students. Randy sent me an e-mail back and copied Tracey Todd and Amy Konrath from the PR department at IndyCar. We e-mailed each other back and forth for 3 weeks. Three days before the convocation at the elementary school, Tracey Todd sent me an e-mail saying the driver they had coming had cancelled due to hosting a sports show about the Indy 500. One day before the convocation, Tracey called me to say that Firestone Indy Lights driver, Stefan Wilson, would be attending the convocation. Friday, April 29, 2011, Stefan called me to say he was leaving Indy and had stopped by the IndyCar offices and was running late. Thirty minutes before the convocation, Stefan called me to say he was 15 minutes out and would be to the school early. When he arrived, he grabbed a huge box out of his trunk. Inside were 269 IndyCar folders, bookmarks, schedules and decals. I could not believe IndyCar gave enough stuff so that each student could have all of these things. Waterloo had bought Centennial decals so that each student that did not win tickets could still take something home with them about the Indy 500. The convocation lasted 45 minutes and was emceed by me. We started with a clip of the 2006 Indy 500 when Marco Andretti was battling Sam Hornish, Jr. for the win. I did a Q&A session with Stefan so that the kids could get to know him better. He was very personable and nervous. He relaxed and did very well. I then announced the winning students and Stefan handed them a voucher to give their parents on how to claim the tickets. He shook their hand and told them "good job." I did 15 random drawings so that a student from each class won tickets as well. It was a great time. I then surprised Stefan by having Waterloo’s Town Manager present Stefan with a plaque naming April 29, 2011 as Stefan Wilson Day in Waterloo. He was totally surprised. Every member of Town Council had signed the resolution to make it official. Stefan stayed at the School for an additional 30 minutes to autograph all 269 Centennial Decals. Who does this? Only someone that really cares about the fans. Kimberley Jackson is the communications manager at Andretti Autosport. She contacted me about running the story on their site. I gave her permission and to use any pictures they wanted. I kept in contact with Kimberley and in July, I had the experience of a lifetime. On July 15, I took the IndyCar 2 seater ride. I contacted Kimberley a week before, to see if it was possible for my family to take a tour of Andretti Autosport. She said they normally don't do that but it also depends on the shop’s schedule. She sent me an e-mail back and said July 15 would be okay and to call her when I got done with the 2 seater ride. I got done with the 2 seater ride by 9:30am so I called her. We got to Andretti Autosport at 10am and found out she was in a meeting until 10:30am. We waited in the lobby and looked at all the trophies. She came out at 10:30 and took us out in the shop. She showed us everything and let us take pictures, except for the engines. What a top notch facility. The tour took about 30 minutes. It was an unbelievable day! David with Stefan Wilson during his Waterloo visit. My wife and I decided in mid-September to attend the Kentucky race. I sent Stefan Wilson a tweet to see if it was possible to catch up with him at the track. He said we would definitely see him in Kentucky. I was surprised and happy. I sent Kim an e-mail telling her we might see her in Kentucky and what Stefan said. She said she would set up an official meet and greet to make sure it happened. Stefan had some free time after the autograph session between 4-5pm. Qualifying for Lights was at 5:15 so we set it up. My wife and I arrived at the track at 3:15 and I sent Kim a text to let her know. I ended up winning 1 pit/garage credential from IndyCar Nation Champion membership. We got in line and waited for the Lights drivers to arrive. We saw Kim and Stefan arrive and I noticed Kim was scanning the crowd. I told my wife to go get her and she saw us about the same time and came over and talked to us for 10 minutes. When we got to Stefan he was surprised to see us in line. The first words out of his mouth were "did you get another credential for your wife?" to which I replied no. He then said we could tweet the info or work something out and he would get my wife a credential. After the autograph session, Kim brought Stefan over to us and we got to reconnect for 15 minutes. He was nervous about qualifying because he knew he had a pole position car. He gave me his personal e-mail address and said to e-mail him my wife's info and he would forward it to the IndyCar credentials office. He then left to get ready to qualify and we went to go watch qualifying. When FIL and the IICS qualifying was done, we left to go eat supper at Karlo's Bistro Italia. It was 9:15pm before we got to our hotel. I e-mailed Stefan my wife's info. Within 15 minutes I had an e-mail from the credentials office so she could pick it up. We left early on Sunday to pick it up so we could attend the IICS autograph session. I got a pic with my favorite driver, Tony Kanaan, and a pic with Alex Lloyd because I won his driving shoes from a planking contest he had. After the autograph session, we went to the inside of the track. We ended up waching the FIL race from the Andretti Autosport pit box. We got some great pics of driver intros, as well as, Stefan taking off from pit road. After Stefan won the race, we walked over to victory lane. While he was being interviewed by Versus, he scanned the crowd and saw us. I gave him a high thumbs up and he gave one back to me. My mom said she saw him do it on tv and couldn't believe it was directed to me. After all the media pics, he came over to sign a few autographs for kids and then exited victory lane to go to his hauler. He walked by us and I congratulated him on the win. He shook my hand and hugged me and told me thanks for the support this weekend. We said a couple more things to each other and off he went to celebrate. What a weekend of memories. Kim Jackson did not have to do anything she did for us. Stefan Wilson did not have to meet with us or get my wife a credential but he did. I am passionate about Andretti Autosport for these reasons. I really believe that Michael Andretti should be the first one to win Owner of the Year. Michael's team has won 3 IndyCar races this year with 3 different drivers. He is also the only owner to own a team in each division of the ladder series. He is leading by example and understands that the future of IndyCar rests on a healthy ladder for young drivers to graduate to the IICS. He is a visionary in this regard. He has worked hard to put enough sponsorship together and hire some talented drivers, mechanics and engineers to put together a winning team in each series of the ladder. I have sent Randy Bernard tweets that Michael needs to be set up as an example to the other owners to get involved in the ladder. If Randy would give Michael an owner award, it might cause the other owners to get involved in the ladder as well. I want to thank you for taking the time to read this and do a story on Andretti Autosport. You can use whatever I have written or the pictures I have taken to include in your piece. I never officially met Michael even though I was close enough to touch him in the pits at Kentucky. I could tell he was in business mode and did not want to bother him for a picture or autograph. What other sport would do something like this? What athletes from other sports would go out of there to make some fans happy? As a footnote, Stefan was giving away some of his t-shirts before the Vegas race. I sent him a tweet asking him how can a fan like me that was not attending the Vegas race, get one of his shirts. On Friday, Ocotber 21, Stefan sent me a tweet that he would be mailing me a shirt this week. Wow! What an amazing guy. I can't wait to see how his career turns out. Stefan is a class act. Thanks to David again for a really great letter, and a reminder of what awesome people we have in and around this Series, and at Andretti Autosport in particular. This weekend, the racing community said goodbye to Dan Wheldon in both St. Petersburg and Indianapolis with moving, heartfelt ceremonies. Meanwhile, early Sunday morning, those of us in the U.S. watched a different for of tribute for Dan. Sébastien Bourdais took home the Dan Wheldon Trophy as best international driver at the Gold Coast 600 for V8 Super Cars. It was an emotional moment, and Sebas choked up during his acceptance speech. But really, multiple IndyCar alumni, including Bourdais, Simon Pagenaud, Helio Castroneves, and Alex Tagliani, among others, gave a good accounting of themselves this weekend. Now, I'll admit it: I'm primarily an IndyCar fan. I enjoy a few other motorsports series as well, but none so well as IndyCar. Yet in a week where the motorsports world has had to mourn the passing not only of Wheldon but also MotoGP racer Marco Simoncelli, we are harshly reminder of how there truly is a larger racing community. A look at the F1, NASCAR, IndyCar, and other drivers coming together for Graham Rahal's Wheldon family benefit auction remind us of that as well. It's part of the reason I feel it's important to see IndyCar drivers try their hand at these other racing disciplines. Whether it's Sebas at the Gold Coast or Graham Rahal as part of the winning team at this year's 24 Hours of Daytona, these sorts of events not only put IndyCar and its drivers in a good light, but serve to strengthen the bonds with other racing communities. Not only do these events continue to expose IndyCar talent to potential fans in other series, but they serve as a welcome distraction during the off-season. So, yeah, bring on the Gold Coast 600s, Daytonas, and Sebrings of the world. Hopefully, IndyCar drivers will continue to do themselves and their series proud in these types of events. I’m proud of the amazing tributes I’ve seen honoring, celebrating, and remembering Dan this past week. I’m proud of interviews and articles I’ve seen from drivers and owners such as Alex Lloyd and Sarah Fisher. I’m proud to have legends such as Mario Andretti and AJ Foyt speaking out in defense of this Series. I’m proud to be part of a community that is going to do everything possible to take care of Dan Wheldon’s family. I’m proud to be a part of the most fan-friendly, multi-disciplinary major motorsport Series on the planet. I’m proud of the incredible talent we see on display each and every race weekend. I’m proud that Ryan Briscoe, Helio Castroneves, and Alex Tagliani are racing in V8 Supercars this weekend to honor Wheldon’s memory. I’m proud that Randy Bernard is out there each and every day, fighting for INDYCAR and its fans. I’m also proud of the tremendous people behind the scenes at INDYCAR, who do so much to make it what it is. 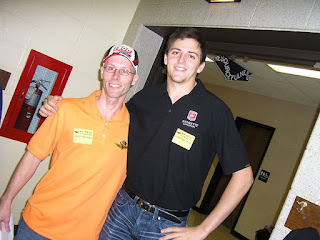 I’m proud of Graham Rahal for organizing a still-expanding auction on behalf of Dan’s family. I’m proud to have ambassadors in this Series like Martin Plowman, who is involved with such great charities for our troops’ families, and Pippa Mann, who is great with kids such as my daughter. I’m proud that so many fans have chosen to denounce hatred and finger-pointing, and instead chose to look towards honor, remembrance and measured changes for the better. I’m proud that thanks to this Series, I can call people from all over North America, South America, Europe, Oceania, and beyond, friends. I’m proud of what this Series has planned for 2012 and beyond, as INDYCAR continues to find its way back. I’m proud to stand with INDYCAR, through the good times and bad, and I’m proud to be a part of it all, in whatever manner possible. Before Las Vegas, I was thinking ahead to my columns I wanted to write this week, and at the top of the list were questions going into the offseason. Obviously, in the last couple days, that’s been the furthest thing from my mind. On Sunday, I am going to Conseco Fieldhouse, and I am going to pay tribute to a great man and a true racer. And we’re not done remembering Dan; there are plenty more memories to share, tears to shed, and an entire legacy to celebrate. But that legacy ties into INDYCAR, and as part of that, we carry on. We don’t stop loving this sport and community, we press forward, and value what we have that much more. And it might just help some of us from going crazy. 1) What sort of tweaks and considerations do we see as the 2012 car (hopefully with a DW-01/Lionheart tribute name) is delivered to the teams? 2) Will the new car and expected performance variations therein be enough to stop the pack racing at places like Las Vegas? Speaking of Las Vegas, does the series return there in 2012? 3) Who ends up in the sponsored GoDaddy seat at Andretti Autosport that would have been Wheldon’s? How do they cope with that situation and expectations? 4) Do the drivers step up their efforts to form an effective advisory body for 2012 and beyond? 5) Will Penske Racing reduce their team from 3 to 2 cars as anticipated, and if so, what happens with Ryan Briscoe? 6) Who will drive for Michael Shank Racing? 7) Will Sam Schmidt Motorsports continue in the Series next year? 8) What will the final schedule look like? 9) Where will the engine carousel stop for the teams not already with an engine deal in place? Will Lotus be an also-ran or a David amongst Goliaths? 10) What efforts will be taken towards changing some of the perceived issues in Race Control this year? 11) How will the situation at Dreyer and Reinbold play out? Is Ana Beatriz one-and-done? 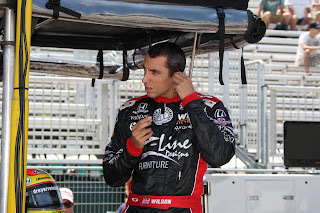 Where does Justin Wilson land?? Wilson's return in 2012 could be as a big free agent. 12) What sort of deal does Alex Tagliani have in place for 2012? 13) Who becomes the next driver at Foyt Racing, and where does Vitor Meira go from here? 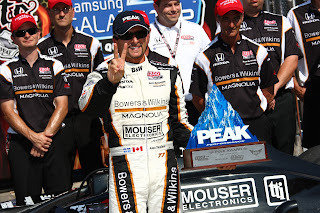 14) Does Davey Hamilton return for one more Indy 500? 15) What sort of sponsorship will Sarah Fisher Racing be able to put together for next year? Will Ed Carpenter return with the team? 16) Will Firestone Indy Lights Champion Josef Newgarden get a full-time ride on a decent team? 17) Can Newman/Haas Racing bring back both drivers and be as competitive as they were this year? 18) Will Sèbastien Bourdais return to the Series and Dale Coyne Racing? 19) Will veterans such as Alex Lloyd and Tomas Scheckter get full-time rides? 20) Does Paul Tracy return for one more year behind the wheel, or retire to perhaps a position in the booth or something otherwise involved in the Series? 21) Did part-time drivers such as Simon Pagenaud, Martin Plowman, Bertrand Baguette, Jay Howard, and Wade Cunningham do enough (and/or get enough funding) to get another shot in 2012? 22) How often will commentators still discuss Danica Patrick, even though she’s changed racing series? How will the Series market their 2012 drivers? 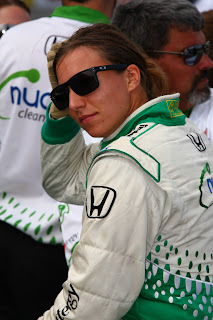 23) How does Simona de Silvestro bounce back from an emotionally and physically draining year? 24) Will the same coverage teams return for VERSUS (NBC Sports) and ABC next year? 25) How does the Indianapolis Motor Speedway handle the transition out of its Centennial Celebration Era and onto the next 100 years? Those are just a few of the offseason questions we’ll explore in the upcoming weeks and months. Just a reminder, there is still racing past this current pain. Maybe it’s too soon for some of us, but eventually, we’ll deal with it together, find a way forward, and start to look at some of these topics. For me, I think it's cathartic just to start asking them. I woke yesterday with that blessed temporary moment of amnesia, before reality came crashing in and I realized yes, Dan Wheldon was no longer with us. I had decided to head over to the Indianapolis Motor Speedway, partially because doing nothing was driving me crazy, and it was the only place that seemed a proper destination. I first went under the track, through the tunnel, into IMS itself. I got out, looked around. It was silent, calm. Cars were in the parking lot, but everything seemed muted. The sky was incredibly clear, the air with a slight nip to it. The track stood as she always does in the autumn, resting, waiting. I always like to think she's reminiscing about the year that was. If so, it's possible she was in mourning like we were. I made my way back out and over to Gate 1, where the impromptu tribute and memorial from fans had taken shape. Cars were arriving and departing regularly as I pulled into the parking lot at 16th & Georgetown. I took my flowers, including remembrances for friends who couldn't make it themselves, and walked over. As I got closer to the memorial, I found myself sobbing. I looked over flags, shirts, bouquets, cards, even a half-gallon of milk, all left by loving fans. It was so unfair, so damned, unrelentingly sad. It broke my heart, and breaks it again now, even to think of it. There was the trophy left by the young schoolboy who claimed Dan as an inspiration. There was the giant Union Jack, the signed photos returned in honor of the man who signed them. You stand there, and all at once you feel small, helpless, angry, and empty. Dan had taken the Speedway and had become an advocate for it, a tireless champion on and off the track. His legacy will never tarnish at this place, will never become dimmed. I thought if his joy in May, of the photos with his young son on the bricks. I thought of how he came back after being written off by so many. I thought that if I could learn to be a man who gave effort and took joy in the same manner as Dan did, I'd be a better man for it. I wept openly, uncontrollably as I left the gate, passing other fans doing the same. I needed to sit in my car for a quarter of an hour before I could call my wife and let her known I was on my way home, to her and the kids. "I will see you again...but not yet...not yet". In a moment on Sunday, everything changed. As 15 cars barrelled into one another, some flying in the air like some grotesque mockery of a wounded bird, as the flames began to blast from the cars, something leapt into our minds, primal, unbidden. As the moments passed, as more drivers were accounted for as safe in the carnage, our fear for Dan Wheldon continued to grow. Championships, points battles--none of it mattered at all. All that mattered was the well-being of a hero, a driver, a friend. Not knowing the welfare of someone you care for is maddening. There's nothing you can do. No gesture or expression seems to be enough. There's nothing but the gnawing, gasping, tearing incrementing of horror. You heard the announcement from the public address system. There’s not a sound. Men are taking off their hats. People are weeping. There are over 300,000 fans here not moving. Disbelieving. We're heartbroken, devastated. Empty. The racing will continue, eventually, but we are minus a great gentleman, a true champion, but most importantly, a man who loved and was loved in return. I got to interview Dan, then meet him in person at Kentucky. He was gracious, fun, and an incredible ambassador for this sport. He was a champion, an honorific inadequate to his warmth, personality, and love of racing. That is what he will forever be to those of us, part of this INDYCAR family, a legacy immortal against the ravages of time. We use the term "honored" in a lot of ways, perhaps too much, but it was an honor to know Dan Wheldon. It was a privilege to see him race, and listen to him talk about his love of racing, and what it meant. He personified the idea that if a person wouldn't give up, they could bring themselves back from disappointment and rejection. I'm proud to be a fan of a Series and a track he chosen to make his home. I wish I had words like Sid Collins for you. I wish I could tell you just how you can hate and irresistibly love something at the same time. I wish I could say something, anything to make it better. But I don't have any answers. Just an abiding love for the sport, and sorrow for a fallen hero. God bless all of you, and your families, and our INDYCAR family. We were greeted this morning with the news that Vitor Meira and AJ Foyt will be parting ways after Sunday's race. Apparently, the relationship was not working for either side. Despite some flashes of success this year, it became apparent early on neither Foyt nor Meira would be breaking their respective winless streaks anytime soon. It's tough to project where Meira might find a home next year; his next team will be his fifth, and as close as he's been to victory in the past, there are many veterans out there looking for rides. There will be more time to dissect this later, of course, but it does give us a question mark of a situation to ponder during the upcoming offseason. 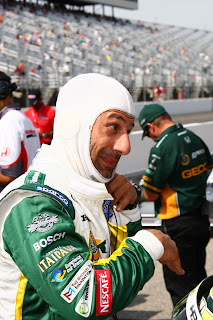 -This season has been so feast or famine for Tony Kanaan, especially after engineer Mike Cannon left the team. This weekend couldn't have started out better, with him winning the pole. Hopefully, this is one of TK's "good weeks". -It might be overlooked this weekend, but after James Jakes' crash on Friday, Dale Coyne Racing did not have a full backup car for him. The folks at KV Racing helped out, getting DCR some valuable parts that they needed to complete Jakes' ride. If you want to talk about sportsmanship, that's a fine example right there. 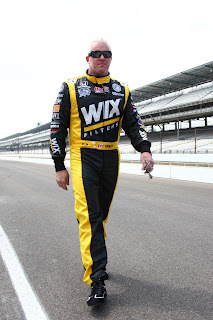 -Wade Cunningham is shaping up to have another impressive weekend, starting P12. Interesting enough, both positions 12 and 13 (Scott Dixon) state their hometown as Auckland, New Zealand. -If you're wondering why Buddy Rice is starting just in front of Dan Wheldon in the back, it's because he went below the white line in qualifying. It'll be interesting to see how both Rice and Wheldon manage through the back half of a pretty close field. -Great to see Ed Carpenter qualify in the second row, keeping that Kentucky momentum going. Alex Tagliani might have changed cars this weekend, but he was still fast enough for the second row. I think a victory by either of those folks would make a lot of people happy. Then again, you can say that with plenty of drivers in this field. -How many cars will Wheldon pass on the first lap? I'm guessing whatever the total, Tomas Scheckter (P23) surpasses it, in usual banzai fashion. There should be a constitutional amendment making TScheck start in the back half of the field, just to watch him pass everyone on the outside. -It looks like this track will be just as competitive as we thought it would. Get ready for some three-wide racing, some close calls, and a very crowded pit situation. These cars are relics after this race, so let's see who goes for broke. With an extended schedule in place for the IZOD INDYCAR World Championships at Las Vegas (cars will practice today, qualify Friday), I decided to release our Las Vegas Preview a day early this week. Simply put, we’re in for a great weekend, by all accounts. Great storylines, a fast track that should allow for passing, battles all over the place, and a packed field with veterans, rookies, and journeyman. Really, whether you’re at home or in Las Vegas, this is a great weekend to just celebrate INDYCAR. It’s definitely the most hype we’ve seen for an event since Indy, and whether you love or hate the outgoing Dallara, this is the farewell song for IndyCar’s old workhorse. There will be multiple teams fighting for the win, and every underdog will be thinking “maybe, just maybe, I can do what Sarah Fisher and Ed Carpenter did…”. Hope springs eternal. This is a great time to celebrate being an INDYCAR fan, and to introduce someone to it—although I still say a trip to Pole Day or Bump Day, if not the 500, is always the clincher. Enjoy what we have, and enjoy watching some of the faces in this field get their one shot at glory, others potentially close out their careers, and still others aim for closing out the year on a high, promising note. There Can Be Only One: Obviously, the big fight this weekend is for the IndyCar championship, with Dario Franchitti coming in with an 18 point lead over Will Power. Both drivers should be fast, but 18 points is a big deficit to come back from. A single incident on track or in the pits, though, and this one could change in a hurry. There Can Be Only One, Junior Edition: JR Hildebrand. James Hinchcliffe. One of these two drivers will be Sunoco Rookie of the Year. Hinch has a 6-point lead, but Hildebrand is on Panther Racing, who knows a their way around a 1.5 mile oval. The ROY winner will be whichever driver acts least like a rookie out there. $5 Million Challenge: So, can Dan do it? That's the question we're all asking. Although it's going to be tough, it'll be exciting to see what sort of run he gets early in the race coming from P34. Avoiding early incidents as he moves up through the back of the pack will be big; no one wants to see his day (and the promise of a cool $5 mil) end on Lap 4 due to a one-off entry careening off a wall. Wheldon doesn't have to do a thing to cement his status as an Indy Legend--but pulling this off would put him in Epic territory. Danica’s Farewell: At Kentucky during driver announcements, Danica was greeting with a mixture of cheers and boos. One of the most polarizing figures in American open wheel history is leaving the sport. Will she challenge for the lead, as she did at last year’s season finale? Will she keep her no-DNF streak alive and snag another Top 10? The time to analyze what her departure and tenure means to INDYCAR is for a later time, but if ABC inexplicably yet again cuts away to her car in mid-pack during an intense 3-way battle for the lead, just breathe and remind yourself “one more race…”. Either way, this is it for Danica full-time in the series. Sarah Fisher Racing Returns: Coming off that INCREDIBLE win in Kentucky, Sarah Fisher Racing has reloaded for Las Vegas, with Tomas Scheckter in the #57 Angie's List special car as Ed Carpenter's teammate. This should be a fun duo to watch on track. Still Looking For That Win: Teams from KV Racing to Newman/Haas to Panther Racing are still looking to gain a victory this year. The exciting thing is, all three teams mentioned are completely capable of making it happen. There have been times this year when drivers such as Tony Kanaan, Takuma Sato, James Hinchcliffe, Oriol Servia, and JR Hildebrand have all been fast enough to win. It hasn’t happened for them yet, but they aren’t quite yet finished. Andretti Finishing Strong? : Marco Andretti looked to be in contention last week until his pit incident. Ryan Hunter-Reay almost grabbed another podium at Kentucky. Can this team find enough to make it 4 victories on the season? You have to think Marco and RHR will at least be strong, and Danica should have enough for at least a Top 10. TEAM Battle: As I mentioned last week, the battle for the Top 22 spots is anything but finished. Keep a close eye on EJ Viso, Simona de Silvestro, Charlie Kimball, and Ana Beatriz. An early exit by any one of these drivers could decide their fate as far as their entries' TEAM funding next year is concerned. Simona and HVM: Still not in the clear. Iron Man Mike: The Series will be honoring 6 year-old "Iron Man Mike" Michael Wanser during the Las Vegas race. For those of you who haven't heard, Iron Man Mike is a the brave young son of Target Chip Ganassi Team Manager Barry Wanser. He's given leukemia a tremendous, inspirational fight, and his story has touched a lot of lives. If you've got kids this weekend, spend some time with them, tell them you love them, and maybe watch the race together. Resources: If you’re looking for a nice illustration of precisely what’s at stake and where different drivers can finish, check out this page over at indycar.com. Also, this thread at TrackForum will come in handy for visitors and viewers alike. Best Livery: Paul Tracy’s #8 Motegi Wheels ride and Mike Conway’s #27 Grime Boss cars are both really nice designs as well as examples of what you can do with a black base on a car. However, as regular readers may know, nothing compares with the glory that is the Dad’s Root Beer livery of the #22 Dreyer and Reinbold car. Be worthy of those colors, Townsend Bell. Be worthy. Let's Make It 36: Bertrand Baguette and Martin Plowman, you are not forgotten.It'd be great to have them both in the field for this one. 2012, guys (virtual fist bump). Pole: Will Power had a wickedly fast car at Kentucky, and he should have the same at Las Vegas. Winner: I like Scott Dixon's odds. He won last year's finale, and I don't see why he can't do the same here. My Sentimental Pick: As you might have guessed from my article yesterday, I’d like to see Oriol Servia or James Hinchcliffe bring this one home. Newman/Haas has been in the mix all year, and it’s time to see them at the top of the podium again. Champion: Since before Kentucky I’ve been preaching how Dario’s veteran experience and luck will likely win out in the points battle. That said, every time we think we have this season figured out, something happens to surprise us (See: Long Beach, Indy, Iowa, New Hampshire, Kentucky). The head says Dario, the heart says Will. We’ll see what those crowded pits and Lady Luck say about who walks way as this year’s champ. Let's enjoy the weekend, make it a quality one, and meet back on Monday to talk about how it all went down. With only one race remaining in the 2011 season, there are still a number of entries looking for that elusive victory. Of all the teams representing those entries, perhaps the closest to victory circle without tasting it would be Newman/Haas Racing. Look, amidst all the championship talk and flash for Las Vegas this weekend, can we take a minute to appreciate this team’s resurgence? It’s easy to forget that this team seemed to be on the ropes this year, mired in an uninspiring season, with repeated midpack finishes (or worse) by Hideki Mutoh. It looked like it might have been the end of a tradition for one of the most historic, successful teams of American open wheel racing. This was the team of Mario Andretti, Michael Andretti, Nigel Mansell, Sèbastien Bourdais, Cristiano de Matta. It was the team of Paul Newman, and of a combined eight championships. Yet in 2010, the light of those incredible accomplishments seemed very dim indeed. Some rumors even suggested the team might not be able to answer the bell for the 2011 season. Yet 2011 would prove to be a different year indeed. Retaining the services of NHR alum and veteran driver Oriol Servia, this team showed its experience, staff, and legacy was far from dead. A well-respected journeyman for much of his career, Servia was repeatedly in contention for podiums throughout this season, with six Top 5 finishes, including a P3 and finishing runner-up twice. Going into the finale, Servia finds himself locked into P4 in the overall championship standings. The #2 Telemundo car has simply been a fixture up front this year. That in and of itself would be impressive enough, but Servia wasn’t alone out there. James Hinchcliffe joined the team in the second race and has done nothing but take the lead in a hard-fought Sunoco Rookie of the Year campaign. Hinch has racked up 7 Top 10s in the #06 Sprott car, and has had near-misses on two podiums. Sure, he’s looked like a rookie at times, but far more often, he’s looked like a true veteran out there. Who would have imagined at the end of 2010 that this team would have experienced such a renaissance this year? I’ve got a lot of drivers and teams I like in the mix at Las Vegas, but if Newman/Haas were to win Sunday, it would bring a story of redemption full circle. Do they need to in order for this to have been a great season for the team? No, but I’d like to see a team that defines perseverance, redemption, and a proud tradition get the win. It would seem to be a fitting exclamation point on what they’ve managed to do this year. When you’re watching this Sunday, take a minute to appreciate what Newman/Haas has accomplished this season. INDYCAR is simply better when there’s a strong Newman/Haas team in contention. 34 cars entered. A fast 1.5 oval that should encourage passing. A championship battle, a rookie battle, and $5 million possibly at stake. With that, the IZOD INDYCAR World Championships at Las Vegas this weekend should have all the excitement a fan can handle. Ana Beatriz: A bad day for Bia in Kentucky exemplified what sort of season it's been for the rookie. Simply put, the results have not yet kept up with expectations. Las Vegas will be a last chance to finish on a good result. James Jakes: Jakesy has had a respectable season for an unheralded rookie, but hasn't shown much in the points standings yet. A clean midpack finish here while learning another oval would be a good result for him. Pippa Mann: After a qualifying incident in Kentucky, Pippa kept it clean and improved the car over the course of the race. Her next big challenge will be showing improvement and staying out of trouble in a very crowded Vegas field. Alex Lloyd: No one denies Lloyd's skill, but this Dale Coyne car just hasn't done much on the ovals this year. It'll be likely be a fight for Alex unless the team figures out some of the issues they've had, but he'll get all he can from the machine. Sebastian Saavedra: Saavedra is back in the #34 car for the finale, but despite showing flashes of speed, he's not had great results this year. His 2012 plans are unclear, and this will be his last chance to impress before the long offseason. Simona de Silvestro: The Iron Maiden was surprisingly fast in qualifying for Kentucky, but HVM's "Pork Chop" had some mechanical issues. We'll watch to see if she can have similiar speed in qualifying, and stay out on track during the race. Charlie Kimball: Kimball is another rookie we perhaps expected to see a bit more from, but outside of a couple of Top 10s, it's been a rough learning season. He's quite capable of a Top 10, but can't have any mistakes in this talented and deep of a field. Davey Hamilton: The only driver in the field who raced here with the IRL (several others did with ChampCar), this might be Hamilton's final race in INDYCAR. If it is, let's hope it's a good one. Paul Tracy: Honestly, I'm not sure what Dragon Racing or PT have left for 2011, but I'm not going to count out a good finish for the veteran. This team has had a poor season overall, but PT's usual aggression could at least make their season finale interesting. Let's see what PT and Dragon have. Jay Howard: Howard might be one of the biggest question marks in the field. I fully believe he can find speed with Rahal Letterman Lanigan, but am curious to see how he does over the course of the race. He gets lumped in with the dark horses, simply because I can't make up my mind. Mike Conway: Outside of his Long Beach win, Conway's season has been pretty forgettable. Yet I'm still not totally comfortable counting him completely out. He has a way of popping up out of nowhere when it's least expected. EJ Viso: With Viso, there's always that glimmer of hope. He managed twin Top 10s in the Texas races, a track that's reasonably similar to Las Vegas. The question, of course, is can he stay out of trouble in this crowded of a field? You be just as well off and obtain as much accuracy asking a Magic 8-Ball as you would a racing pundit. Vitor Meira: It's been a pretty average year for Vitor and the AJ Foyt team, but they usually manage to at least have a chance at a Top 10 finish. As much as I'd like to see Vitor break his winless streak, I don't think this is the week for it. Helio Castroneves: With his string of 11 straight seasons with at least one win in jeopardy, Helio comes into the last race of the season. Honestly, he doesn't seem to have much mojo working for him right now, but you still can't count him out on the ovals. Tony Kanaan: TK's results have been pretty up-and-down lately, but he's usually one of the most exciting kind of drivers at this type of track. Let's hope the super-exciting, pass-happy TK is the one showing up this weekend, along with a car to match. I had to use this pic. Somehow. Takuma Sato: Taku has shown the raw speed to compete and potentially win this year. Outside of an early out at Indy and a midpack result at Kentucky, he's been impressive on the ovals. His raw speed will need some discretion and luck added to pull off the Vegas win, however. Danica Patrick: This is Danica's last full-time race in the Series, and it should be her kind of track. Expect at Top 10 result at least, and she could duel for even better results depending on how things go. I think we all remember her battle with Tony Kanaan in the Homestead finale last year. Townsend Bell: Bell recovered nicely in Kentucky after a weak start, and I like his status as an "Oval Assassin". He gives Dreyer and Reinbold a decent shot at a good finish for the #22 machine. Buddy Rice: As a second driver for Panther Racing this weekend, Rice should have a pretty good shot at another strong race. You can't count out a Panther driver on ovals, especially not a former 500 winner and oval ace such as Rice. Alex Tagliani: Tag has sat on the pole twice this year on ovals, but Dan Whelon will be in his usual #77 Bowers and Wilkins SSM car. Instead, Tagliani will be in the #98 BHA/SSM car, which will likely lack some of the raw speed of his usual entry. Tag is another driver with an unknown future, but after sitting out Kentucky, he should be even more driven at Las Vegas. Tomas Scheckter: By merit of rocking it at Kentucky, SFR gets their own favorable slot here. Scheckter will go 3 wide, pass about 8 dozen cars, and will generally make life more exciting for fans and fellow drivers alike. Ed Carpenter: Momentum? Las Vegas might not be a second home for Carp like Kentucky is, but he should still be able to manage a good finish. Let's hope Sarah's good luck charm Baby Zoey is in attendance again. JR Hildebrand: Hildebrand ran well as expected at Kentucky until his pit incident doomed his day. He'll now have to hope another quality Panther oval outing can propel him past Hinch for Sunoco Rookie of the Year. James Hinchcliffe: The Mayor just missed out on a podium at Kentucky, and looked like an old veteran doing it. If he can pull together one more quality race, he could have the rookie title in the bag. Wade Cunningham: Texas wasn't kind to Wade, but he slung that AFS/SSM #17 entry around Kentucky like he'd been in the Series for years. If he shows that sort of polish again, he should be fun to watch. Oriol Servia: Arguably the best driver to not win a race this year, O's got one more shot at it in Vegas. It would be a fitting exclamation point to the resurgent season of Newman/Haas Racing if it were to happen--and it absolutely could. Ryan Briscoe: Briscoe's season has been up-and-down, but he had a pretty nice result at Kentucky and has generally looked better as the season has wore on. His future at Penske is a big question mark right now, so it would be doubly nice if he could find victory circle to close out the season. Marco Andretti: Until his collision in the pits with Alex Lloyd at Kentucky, Marco looked to be in line for at least another podium result. Instead, the most mercurial of the IICS drivers saw a good day go south quicky. The question is, will Las Vegas be an Iowa or a Kentucky for the young Andretti legacy? Ryan Hunter-Reay: RHR was dueling it out with the leaders until the final laps in the last race. He's already won this year at New Hampshire, and might be Andretti Autosport's best chance at another win going into this race. Few drivers through the field look as sharp as he has lately. Graham Rahal: Yes, running out of fuel at Kentucky didn't do much for Graham Rahal's disposition. He should at least contend this weekend, but at this point, but at this point you have to wonder if he can have a mistake and bad luck-free race. Scott Dixon: Dixie was again right in the mix in Kentucky, and there's no reason he shouldn't be a favorite at Las Vegas. He'll work with teammate Dario Franchitti to protect the Scotsman's championship lead over Will Power, while seeking another victory himself. Dario Franchitti: Let's face it: Dario has the experience, the luck, and a decent points lead going into the last race. He's going to be tough to stop in this one, unless that famous Franchitti fortune turns sour. Will Power: Yes, Target Chip Ganassi will be a formidable foe, and 18 points are a lot to make up. But Power's going to have a fast car, and still has plenty of fight left in him. It only takes a single moment to change everything. Dan Wheldon: Wheldon will start P34 as part of the Go Daddy $5 Million Challenge, but will have an impressive 1.5 oval record and a likely fast car to rely on as he fights his way forward. Can he do it? Sure it'll be tough, but in that little part of our soul that makes us pull for the underdog and dream that Hollywood-style finishes can happen keeps hope alive. Welcome to INDYCAR's Championship Week. It's going to be a great one. Cheers. What an amazing job by Through The Turbulence. Make sure to stop by and visit them. Obviously, this is the biggest one. Will Power held the lead over Dario Franchitti going into Kentucky, only to now find himself 18 points behind going into the finale. Power should still be fast at Las Vegas, but Dario has experience and usually luck on his side. Still, with a crowd field (and pit row! ), this one could switch very quickly. With Scott Dixon and Oriol Servia respectively locking up P3 and P4 in Kentucky, the next big battle is all about finishing in the Top 5. Tony Kanaan has suffered a late-season fade, and now sits only two points ahead of Ryan Briscoe for the spot. Both drivers have been hit-and-miss this year, with sparkling results following poor outings, and vice versa. Ryan Hunter-Reay has a chance at this spot as well, sitting only 19 points behind Kanaan and on a strong second-half kick. Marco Andretti is 29 points behind, but needs a great result and some luck to make it happen. Danica Patrick currently holds P10 in the standings over Helio Castroneves by two points. Helio has certainly struggled this year, but he’s still going to be in play any time he’s on the track with Penske Racing. Only 10 points behind Helio sits James Hinchcliffe, looking to both secure Sunoco Rookie of the Year honors and squeak past for a Top 10. If he can race like he did at Kentucky, he’s got a chance at both. Both Takuma Sato and Hildebrand (5 and 6 points behind Hinch) lurk just behind in P13 and P14, still within striking distance. Graham Rahal sits in P9, 6 points ahead of Danica, and would like to ensure he stays ahead with a good final result. Things get really cluttered deep in the standings. Alex Tagliani missed a race, but is still in a tie with JR Hildebrand for P14. Vitor Meira sits only 9 points behind them. Basically, the entire situation in the back of the field is fluid. Hildebrand or Sato could make the Top 10, or they could fall out of the Top 15. Consider this: between Patrick (P10, 359 points) and Tagliani/Hildebrand (T14, 296 points), there’s a swing of only 18 points. This is a race where 9 cars will finish 25 or worse, resulting in only 10 points earned. Just over a quarter of the field will earn minimal points. What does that mean? It means there are going to be some good drivers who end up scoring pretty poorly. They’ll have to watch from sidelines, hoping their nearest point rival follows their example. Expect a lot of folks to rise and fall down the point standings before this is all over. We’ve come all this way this season, and yet so much of the field remains within striking distance of one another. I happen to think that’s pretty exciting stuff. Have a great weekend, and get geared up for what should be a championship week to remember in INDYCAR. Tag missed a race, but he can still move on up. The TEAM Battle continues to be one of the top 22 full-time IZOD IndyCar Series entries. Once again, as a reminder, TEAM money is INDYCAR’s program to reward full-time participation in the IZOD IndyCar Series. For 2012, the Top 22 full-time entries in points from 2011 will get their share of TEAM money, worth at least $1.2 million per eligible entry. 20) #59 Car, KV Racing (Viso), 241 points. 21) #78 Car, HVM Racing (de Silvestro), 240 points. 22) #24 Car, Dreyer and Reinbold (Beatriz/Pagenaud), 236 points. 23) #83 Car, Novo Nordisk Chip Ganassi Racing (Kimball), 233 points. 24) #34 Car, Conquest Racing (Saavedra/Battistini), 208 points. 25) #18 Car, Dale Coyne Racing (Jakes,), 189 points. On the surface, it would appear EJ Viso (#59) and Simona de Silvestro (#78) should be safe. However, to clinch, they can't just score P33 and hope that no one else has a good race. You want to guarantee a stay in the Top 22? Score some points beyond the minimum. Honestly, looking at this list, perhaps the driver in the most danger of not finishing in the Top 22 is Ana Beatriz. Charlie Kimball managed a decent finish at Kentucky, and you have to think will have more potential in his car in Las Vegas. Both rookies have had disappointing first years, and finishing outside the TEAM spots would be insult to injury (or possibly the other way around). Kimball needs to finish strong. What, then, of James Jakes (#18) and Sebastian Saavedra (#34)? The lowest points total anyone starting Las Vegas will receive is 10 points. If James Jakes grabbed pole position, led the most laps, and won (53 points), he still would fall short of Charlie Kimball's total, assuming Charlie in the #83 only garnered 10 points (243 to 242). Jakes has shown plenty of improvement this year, but the finishes haven't been there to propel him upward through the standings. Saavedra is still mathematically alive for the P22 spot, but would need to see Bia (#24) score only 10 points, while he finished P1 or P2 in the race. Needless to say, that's going to be a tall order for the Colombian rookie. (At least it sounds like he'll get the chance to make his own destiny, since he's confirmed he'll be returning to the #34 car for Las Vegas after missing Kentucky). So really, for this battle, Viso, de Silvestro, Beatriz, and Kimball will be the drivers to watch. The most likely outcome is that one of those four drivers is on the outside looking in when the checkered flag waves at Las Vegas. With only 8 points separating these drivers, big money for their teams and entries for 2012 is at stake. We'll see who rises to the challenge, and who gets left behind. -I am sunburnt, tired, and have almost completely lost my voice from cheering like a madman. Yet I could not be happier. I was at Kentucky Speedway on Sunday, and I witnessed one of the best race finishes I've ever seen. Let's jump right into the observations. We have to start with Ed Carpenter. He dueled one of the IZOD IndyCar Series' best, in a car with more of a budget than his Sarah Fisher Racing team could ever dream of. And after 113 IndyCar starts, he got a victory--one that no one can say was not beautifully earned. We talk a lot about drivers "deserving" a win or a particular outcome. A lot of times, we stretch the meaning of that, I think, but if anyone deserved a win at Kentucky Speedway, it was this driver, this team. It's the sort of story you just can't improve on much. What a fight--what a duel over those last 15 laps! My section absolutely exploded with cheering when Ed nosed ahead at the line. 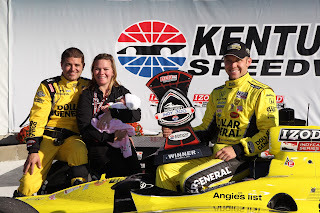 I don't know what 2012 holds for Sarah Fisher Racing or if Dollar General will be back as a sponsor, but that was a heck of a way to wind down the season. -The pit lane incidents were scary from the stands, especially when Simona de Silvestro hit EJ Viso's crew member. He flew through the air like a rag doll, it seemed. It's a reminder that this is an inherently dangerous sport, and that the unexpected can happen at any time. -While Scott Dixon wrapped up the AJ Foyt Oval Trophy on Sunday, both the Series championship and Sunoco Rookie of the Year fight are still coming down to Vegas. I think spotting Dario Franchitti 18 points coming into Las Vegas makes the odds pretty poor Will Power pulls it off now, unless there's some carbon fiber carnage on track. The ROY battle is perhaps even better, with James Hinchcliffe negating Panther's oval advantage by jumping to a 6-point lead over JR Hildebrand. The rookie battle likely comes down to whoever makes the fewest mistakes at Las Vegas. Good: Wade Cunningham. Made some smart moves and finished a strong P7 in a challenging field. He looked exceedingly sharp. Bad: Will Power and JR Hildebrand have to share this one. Both had pit incidents, both lost leads over their rivals, and both should have finished higher than they did if things had just gone a bit differently. Ugly: Ana Beatriz. There was the incident in pit road that might have destroyed Will Power's championship hopes, then she later crashed out in a single-car incident. Not what we want to see from her this late in the game for her rookie season. -If he doesn't have his incident with Alex Lloyd, I think we're talking about Marco Andretti as Kentucky race winner this morning. He looked strong before the mishap. -It was a mixed weekend for Dan Wheldon. On one hand, he didn't qualify after his car failed tech inspection, so that's not a big help on Las Vegas pit selection. However, he did get some time back in the current Dallara, showed he could move through the field, and basically got a good warmup in for his big challenge in two weeks. -Some drivers with quietly very good weekends that haven't been mentioned: Ryan Hunter-Reay, Oriol Servia, and Buddy Rice. Townsend Bell also finished P11, a +15 mover on the day. I also had the chance to see Dan during a fan session at Macy's over the race weekend. He's an amazing, charismatic ambassador with fans. We're lucky to have him around in the Series. I'll be looking forward to him in a full-time ride next year. -I thought Pippa Mann's outing Sunday was what she needed, no more, no less. It didn't look impressive in the box score, but after a qualifying crash leading up to the race and her earlier struggles at New Hampshire, it was important to show she could put together a clean race and improve over the course of it. Improving at Las Vegas is the next goal, of course. 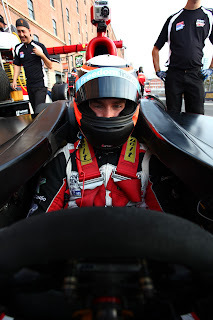 -If I'm Dillon Battistini, having "Driver Fatigue" as my reason for dropping out in my first IndyCar start wouldn't be ideal (apparently, he'd been sick for a few days leading up to the race). Then again, I'm a chunky blogger who would wear himself out trying to fit in a Dallara, let alone drive one. -Big congrats to Stefan Wilson on his second Firestone Indy Lights win of the season, and to Josef Newgarden for his winning the Lights title this year. Let's hope for bigger and better things in their own time for both of those guys. -A huge Thank You to VERSUS' INDYCAR team. You guys show other networks how it should be done. You listen to fans, make improvements, and you can tell you genuinely care about this sport. Cheers, and I'm excited to see what changes the NBC Sports banner brings next year. -It sounds like Kentucky Speedway might be on the chopping block for Series' 2012 plans if a $250k-500k title sponsor for the race isn't found. It isn't set in stone yet, so there's still time to play here. If you loved what you saw Sunday, let people know. Let Randy Bernard know, and send him your feedback. It would be wonderful to see the Series work with a manufacturer such as Chevy or Lotus to sponsor this race. Don't give up hope yet--push for what you want to happen. I'll tell you this, though--I do not want to lose this race. -Yesterday, we saw a highlight of INDYCAR that we'll be seeing for years to come, I think. To those of you who attended or decided to watch, you know you saw something special. I'm not sure what the future will be for INDYCAR at Kentucky Speedway, but I'll never forget this year's race.